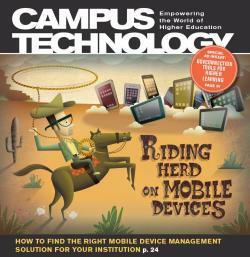 Schools are turning to mobile device management solutions to create some order out of chaos. The CIO of Lone Star College System (TX) shares how to evaluate the potential of virtual desktops. How to make your site more attractive to students, plan a mobile strategy, and more. For scalable A/V systems that work seamlessly, consultants and integrators may be your best bet. Federating, centralizing—and even outsourcing—IdM can improve security and lower costs. Login: Is IT the Worm in the Apple? E-Learning Report: What Good Is the M in MOOCs?